June 20 is World Refugee Day—a day dedicated to raising awareness of the situation of refugees around the globe. Today, more than 66 million people have been forced from their homes because of conflict, persecution or disaster. This is the highest number since World War II. Of these, more than 22 million are refugees, who have left their country, often risking their lives, to seek safety for their families. Over half of all refugees are children under the age of 18. Refugee resettlement saves lives, encourages other countries to take in those in need of protection, and promotes global security. Since the passage of the Refugee Act of 1980, more than 3 million refugees have found safe haven in America. Between 2011 and 2016, Maryland welcomed 8,213 refugees from Burma, Iraq, Bhutan, DRC, Eritrea, Syria, and other countries. However, the registration and vetting process for resettlement is intense, and can often take years. Each year, less than 1% of the world’s refugees are given the coveted opportunity to restart their lives in a new country. 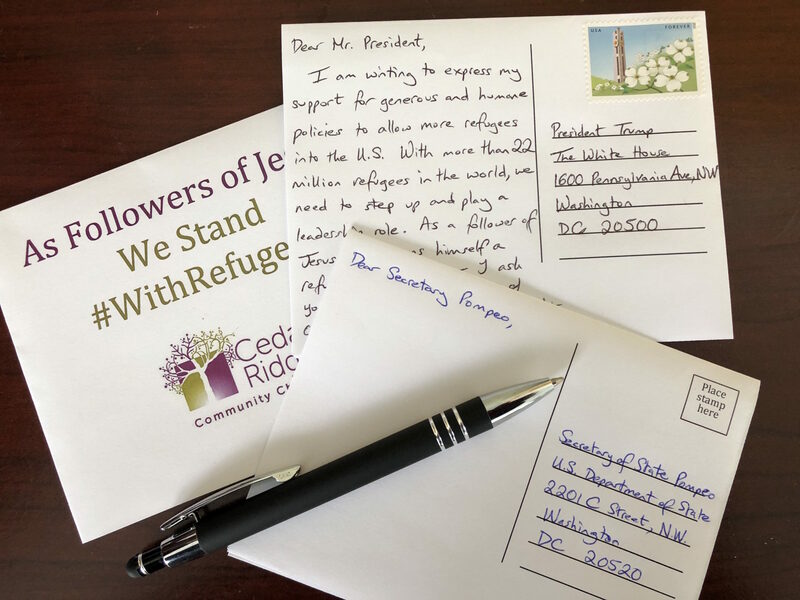 And recently, efforts have been made to further reduce refugee resettlement in the US , and to discriminate against individuals based on their religion or country of origin. Now, as never before, as followers of Jesus—whose family fled to Egypt to escape persecution—we need to stand on the side of compassion and generous hospitality. We need to stand with refugees. Call your senator and representatives (866-940-2439) or governor (410-974-3901) to express your views. Download a printable postcard (fold into quarters and tape shut) to send to policymakers. Click on the photo for possible addressees. Speak up for refugee issues in personal conversations and on social media; use #WorldRefugeeDay, #RefugeesWelcome, and #WithRefugees. Volunteer with or donate to organizations such as International Rescue Committee, Lutheran Social Services, and others. Check out the Lead Pastor’s blog for a personal perspective on refugees and immigration.